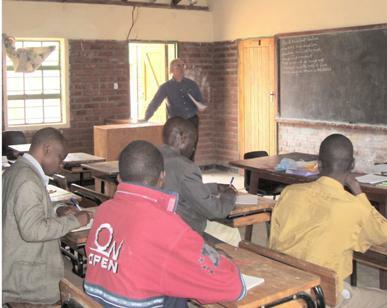 Many teachers in Malawi are not fully trained. The ending of fees for primary schooling and the large numbers of children created a huge demand for teachers and many were recruited without completing training. Shortages in some subjects in secondary schools means that sometimes staff are not teaching their main subject. Volunteers have visited Dedza to carry out short in-service training sessions. Roy Gilbert, who was a maths lecturer at Norwich City College went to Dedza for three weeks. We brought the Malawi textbooks to Norwich so that he was familiar with the syllabus. He carried out three-day training sessions for groups of secondary school maths teachers at three locations. About 20 teachers took part in each session. In recent years, other volunteers have carried out training in Secondary English, Literacy and Bullying Policy. Volunteers have also taught in schools. We have links with both individual schools and the Dedza District Education Department and can organise suitable arrangements. Malawi school term dates are similar to those in the UK. Secondary school subjects such as English, maths and science are very similar to those taught in schools in the UK. If you are interested in undertaking this sort of project, please get in touch through any of the contacts on the website. Volunteers have to pay their own travel and other costs.